WHILE the rest of eastern Australia awaits some sort of summer seasonal break, flooding rain of biblical proportions in North Queensland is disrupting local kills this week. 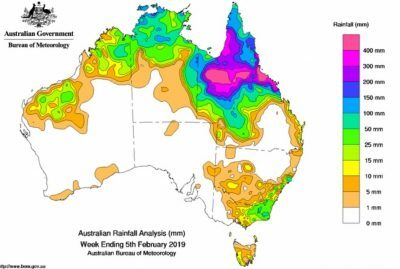 So extreme was the past week’s rain event that the Bureau of Meteorology had to use rarely seen colour codes for its weekly rainfall maps (see image for falls for week ending 9am Tuesday) to account for rainfall above 400mm. Some Townsville hinterland cattle properties recorded just short of 100 inches (2500mm) of rain in the past seven days in falls of unprecedented proportions. Townsville itself also smashed rainfall records, with BOM reporting 1134mm at Townsville Airport in the 10 days to 9am Monday morning – breaking an 80-year record. As the map shows, useful to outstanding falls were received in a wide band across Queensland’s north and northwest, extending into the very dry eastern portion of the Northern Territory’s Barkly Tableland. Good falls extended about as far south as Longreach, but the Central Highlands area around Emerald and Clermont largely missed out. The extreme falls extended west in a band as far as Julia Creek and Cloncurry. A full wrap up on where the north’s rain fell in tomorrow’s weekly rainfall wrap. With drought weakened stock on hand, concerns are now elevated that some cattle in the region may succumb to a week’s drenching rain and quagmire conditions. Some producers will face major fencing and rebuilding work. The longer-term effect will be a late summer grass growing season which ultimately should take some pressure off producers in the region and potentially inject some confidence in restocking from areas further south that have still missed out. Not surprisingly, the JBS export processing plant at Townsville, which opened unusually early for its 2019 season remains shut, and will take some time to re-open after local road and infrastructure damage is assessed. A little further south, Borthwicks at Mackay is also closed today due to cattle supply difficulties due to road access caused by flooding, but is hopeful of restarting operations tomorrow. Mackay will close again soon for its annual maintenance break, likely to be a couple of weeks in duration. Processors in Queensland’s southeast said it was still too early in the season for large numbers of northern and western Queensland cattle to arrive for slaughter, meaning disruptions caused by the northern rain would be minimal. Grid price offers from competitive export processors in the biggest concentration of processing in southern Queensland this morning remained unchanged at 525c/kg for four-tooth heavy grassfed steers, and heavy cows 445c/kg. Both are down 20-25c/kg from where the market sat a month ago, due to strong inflows of slaughter stock from desperately dry areas. Central Queensland offers were more or less the same this week. Last week’s eastern states beef kill was impacted as expected by the Monday Australia Day holiday, but perhaps not as much as anticipated, with numbers back only 7pc from the week before. Queensland declined 3pc to 66,295 head, while NSW fell 9pc to 31,348 head. In Victoria, numbers fell 18pc compared with the previous week to 21,545 head, while South Australia’s kill lifted 13pc to 6098 head. Tasmania recorded the biggest weekly decline, easing 21pc on the week prior to 3968 head.